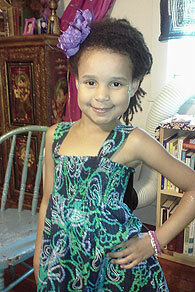 Six-year old Naima Zahari Kamenya is a rising artist with an impressive-sounding name. We asked her mother, Renee Monteil, to share its meaning: "Naima means pleasant in Hebrew and graceful in Arabic, and Zahari is the Hebrew word for brightness." One notices that Naima's spirit is true to such a name after spending just a few moments with her. The young artist was drawn to capturing beauty through a camera lens long before now. We wanted to know more about the inspiration for her most recent photos of flowers, which were captured on a Sony digital camera at the Smith College Botanical Gardens. When asked about why she took these particular pictures, Naima gave a very straightforward response: "I like them and the colors!" Naima's passion for photography began when she was just two years old. (Yes, you read that correctly.) When she was just a small tot, Naima had a natural eye for capturing pictures of people and flowers. Most recently, without any prompting or help, Naima used her dollhouse as a photoshoot inspiration. She designed backdrops, positioned her dolls as her main photo subjects, and took a number of pictures. Then she used these pictures to decorate the dollhouse walls. Photography is not Naima's only passion. In fact, she has many other blooming interests in the realm of art, including dance, painting, and costumes/make-up. She was one of the featured young dancers in the Brattleboro School of Dance's recent Spring show, "Momentum." During her free time, Naima also likes to cook and ride her bike, and she can put together any puzzle after only a few minutes of studying the pieces. When asked about additional hobbies and interests, she exclaimed, "Fairy hunting!" Of course, we had to know about any evidence of fairies during these excursions, and Naima further explained, "They leave sparkles, and sometimes there are fairies in my dollhouse." We would've asked Naima about how she likes to spend an average day, but there is no such thing as 'average' in her world. Most important, she is a devoted older sister to her equally ebullient sibling Sitara. Don't miss the debut of some of Naima's digital camera work, which is featured at the Brattleboro Cheese Shop & Café at 39 Main Street in Brattleboro this month. Stop by during Gallery Walk or anytime during August -- hours are Tues.-Thurs. 7-7, Fri. & Sat. 7-8, and Sun. 7-5 -- and be sure to enjoy some of the extraordinary cheeses that are served as part of a hearty breakfast, in cold and grilled sandwiches, and in cheese or cheese-and-charcuterie platters. A variety of organic, Fair-Trade teas and Mocha Joe's coffees, as well as 65 different sodas, are also available; see www.brattleborocheese.com for more information. Shanta L. Evans-Crowley is a writer, blogger, and photographer in the Brattleboro area.